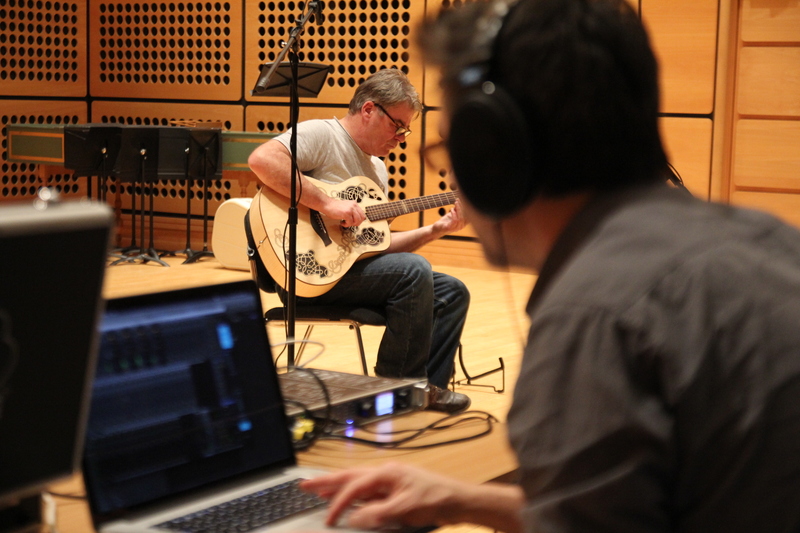 Acoustic guitarist Steve Pinnock has been putting Carolan through its paces while producer Simon Paterson has been exploring how best to record its voice. Based in Nottingham, Steve is an innovative acoustic guitarist, well known for his solo gigs (we can still remember him playing a stunning solo set in front of several thousand people at Nottingham’s Royal Concert Hall) as well as a founding member of swing-combo Mood Indigo. Steve, who was recently acclaimed by Acoustic legend Antonio Forcione, stretches the acoustic guitar beyond its conventional boundaries through an eye-watering array of playing techniques. Simon is a musician, producer and also an educator working in the School of Music at the University of Nottingham. We met Simon a while ago back in post 31 when we interviewed Remi Harris and he raised the possibility of recording Carolan in the University’s wonderful Djanogly recital hall. Steve drops Carolan to the unusual turning of DADGAE and begins with his composition Irish Eyes, a piece that tests out Carolan’s full dynamic range, moving from soft harmonics and finger style to percussive techniques. As well as the tunes and the playing, we love the way that Simon has captured and produced Carolan’s voice in the recital hall. We’re more than happy to turn the rest of this post over to him to explain how he went about capturing the sound …. 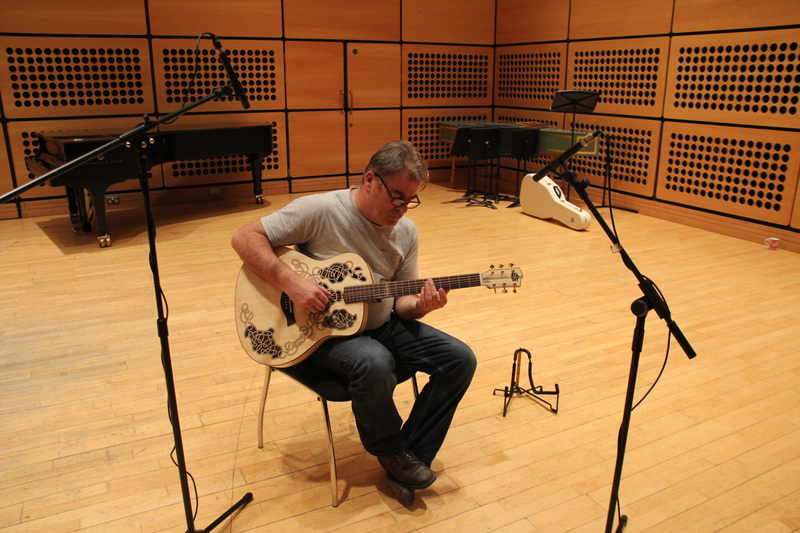 I’ve enjoyed the superb acoustics of Djanogly Recital Hall on many occasions as a member of the audience, but having the chance to record the Carolan Guitar was my first opportunity to set-up microphones and explore its potential for recording. After a strong cup of coffee we set up in the hall. With Steve sitting next to the glorious Steinway whilst acclimatising both to the acoustics of the hall and to the feel and sound of the guitar, I walked around the room listening to the sound as it dispersed around the room. At first, I found the sound to be surprisingly dry and restrained so we sought to find a more suitable spot in which to situate the guitar. In order to capture a true representation of the sound of the instrument in such a way that wouldn’t require additional processing (such as EQ etc) the guitar should sound as good as possible in the room before placing the first microphone. To that end, I asked Steve to play some deep ‘power chords whilst walking around the stage area. I then circled him whilst listening for the sweet spot. We found that about a third of the way into the hall, just below then edge of the sound absorbers in the rafters, provided a decent amount of low end power, and where heavier, staccato chords rewarded us with a decent and appropriate amount of reverberation. Moving the guitar to the centre of the stage, right up close to the first row of seats gave a very decent, recital-like quality which filled the room well, considering the relatively (slightly) quiet level of the guitar. Concerning this last point, we found that the amplitude of the guitar travelled surprisingly well up to the top of the raked seating. This is as you would expect in a top concert hall (i.e. to have acoustics which temper the Inverse Square Law) but in fact there was a certain extra aesthetic quality to the depth of the reverberation that gathered right at the back of the hall. I knew I’d have to consider using an array of mics which would capture both the close, direct sound of the guitar (along with its early reflections), and the natural reverberation, captured at the back of venue. By this point, Steve was getting more comfortable with the guitar and was able to explore the dynamic and tonal ranges of the Carolan guitar to great effect. My aim then was to capture as much low frequency energy, the deep resonances that propagate from the instrument and excite the air molecules in a vibrant way, as possible as these qualities can’t be added in afterwards with processing. I first set up a stereo mic array two rows in from the back of the venue. The resultant stereo width could easily be altered in the mix. For the side (left to right) I used an AKG C414 XLS in figure-of-eight setting, and for the mid (front-facing) an AKG 481 with omni capsule. As stated previously, my intention was to combine two microphone arrays; those picking up the reverb from the back of the hall, with a pair of microphones closer to the guitar. For the close mics I placed an AKG 482 with a cardioid capsule above the top sound hole. The second close mic was an omni, aimed nominally at the 12th fret, at a distance of about 1m. I sometimes calculate the relative distances between the sound source and multiple pics by using either the 3:1 rule () or aim to place each mic equidistant from the source in order to minimise any phase issues. But (helped by Logic’s Correlation meter) I felt confident that the phase correlation was spot on between the two close mics. Happy with the sound in headphones, we went for a take… Steve played through ‘Irish Eyes’ and ‘Against the Flow’ with aplomb and, happy with the takes, I got to join in with my acoustic bass for a little jam session. Later that evening in the studio, I attempted a mix. I decoded the MS array, and added the resultant ambience to the signals from the close mics which had captured the direct, clear timbre of the Carolan guitar very nicely. I felt no need to add additional, artificial reverb, just minimal EQ and light compression. 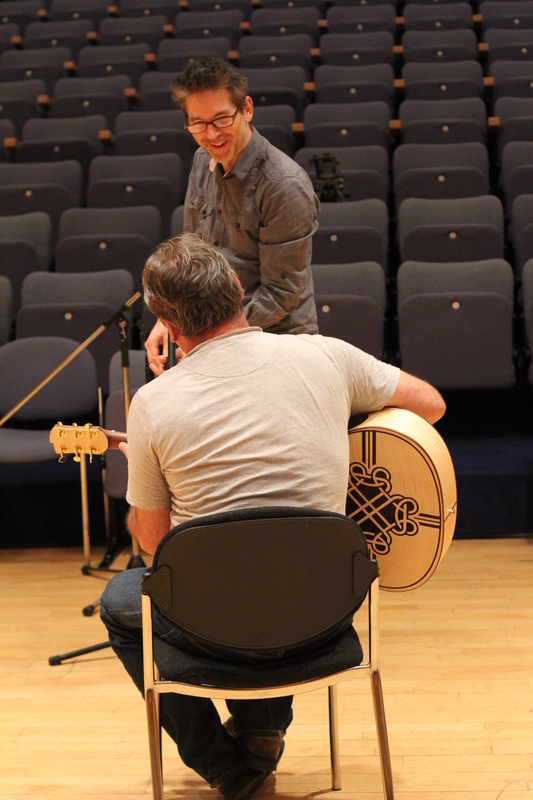 The end result is a very true, honest representation of the Carolan guitar played in Djanogly Recital Hall.